Piezoelectricity is on the rise. Piezoelectric cells produce electricity from vibrations, or conversely vibrations from electricity. The former is relevant for energy harvesting, for our world increasingly needs the small powers that can be produced by piezoelectric generators – in particular for sensors and LED lighting. Piezoelectricity could replace batteries where energy from vibrations exists and would otherwise be wasted, like underneath railway sleepers or under heavy machinery. But even quite small vibrations such as those in children’s playgrounds or in the arteries of the human body, are able to produce electricity, which can lead to self-powered devices, in tune with a world producing ever less waste. Present applications include gas lighters, inkjet printers, shock absorbers, and devices making use of ultrasound. Potentially, applications lie in energy recovery from vibrations in cars, household appliances and industrial machines. The power produced by piezoelectric cells is small – but devices requiring just a tiny bit of electricity are spreading across the world. Many sensors use hardly any electricity at all – nevertheless, if they are battery-powered, they produce waste when the battery is changed, and a multiple of the materials cost is incurred by the manual labour needed to change the batteries, especially when they are in remote locations. A piezoelectric cell that produces electricity from ambient vibrations will do away with both labour cost and waste. Any industrial surrounding produces enough vibrations to power piezoelectric cells. A typical example is the self-powered sensor by the Israeli company Innowattech, mounted underneath railway sleepers, that can precisely transmit speed, composition etc. of any train passing by. US based MicroGen has developed a scalable ‘Vibrational Energy Harvesting Micro Power Generator’ applicable in a wide range of uses, including factory automation, bridge structural integrity monitoring, automotive tire pressure sensors, and hand held electronic devices. British Pavegen and Dutch Tauw develop tiles that produce electricity from footsteps, electricity that can for instance be used for local lighting. 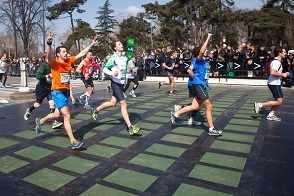 Pavegen demonstrated this nicely near the finishing line of the 2013 Paris Marathon. They installed 176 energy-harvesting tiles, including a 25 square metre span at the climax of the race on the Champs Elysées. Through experiments like these, Schneider Electric, the main sponsor to the race, aims to make the event carbon positive during their four-year sponsorship. Tiles like these do not wear down, they do not require remote transport of electricity, and can generate the power as it is needed, e.g. street lighting as pedestrians pass by, or traffic signs that show when a car approaches. With LED lighting requiring much less electricity, the combination of piezo electric cells and public lighting might be very promising. A quite different application is the mini piezoelectric carpet mounted at the inside of human arteries after heart surgery, in order to power the pacemaker. This combination does away with the necessity for additional surgical operations in order to replace the pacemaker. Expanding on such piezoelectrical carpets, one could imagine our high-rise buildings being clad by such carpets, harvesting energy from the wind. This could do away with the present generation of MW machines harvesting wind energy. Indeed, in Sweden the architecture firm Belatchew has proposed such a building. For the time being, piezo electric cells conquer niches from which they might play an ever increasing role in local energy supplies. Dear Mr. Sheeraz. I am not a scientist myself and cannot answer your question. I know that one of the main aims of research is to find cheap piezo electric materials. For an answer however you should contact the scientists themselves.